My first introduction to the Amalfi Coast was many years ago in the heart of the summer season…August, when many local Italians are on vacation as well. The atmosphere in Positano, where I planted for 10 days, was vibrant and festive. The Italians, always beautifully dressed were in brillant summer color attire with exquisitly handcrafted sandals, walking arm-in-arm talking in their animated way, warm and friendly … obviously delighted to be on holiday in this beautiful setting blessed with endless days of brillant sunshine and bella vistas. To this day, having revisited the Amalfi region many times, I still believe it to be the most beautiful coastline in the world. Sorrento – Sorrento is well connected to all the attractions of the Amalfi Coast and the archaeological sites of Campania, a good place to make a base for your Amalfi Coast vacation. From Sorrento you can take the ferry to Capri, the slow Circumvesuviana train to Pompeii, Herculaneum, and Naples, and bus (or drive) to the Amalfi coast. You can also make frequent trips by hydrfoil from Sorrento to Capri, Naples, Ischia, Amalfi, and Positano. Capri – Famous for the Blue Grotto, the small and charming island of Capri has but two towns, Capri and Anacapri. You can get each around on foot and take a bus between them. There are frequent boats from Sorrento and Naples. 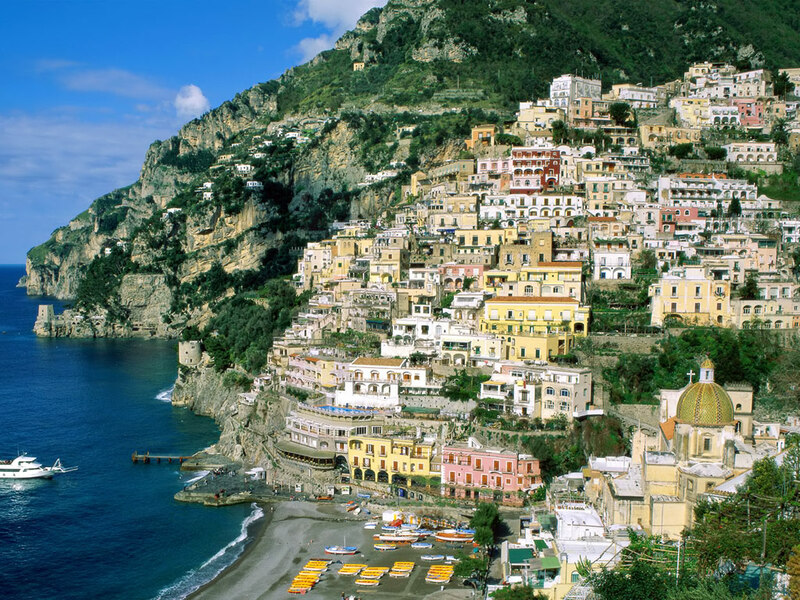 Positano – Positano made the transition from sleepy fishing villages into one of Italy’s most popular resort towns. 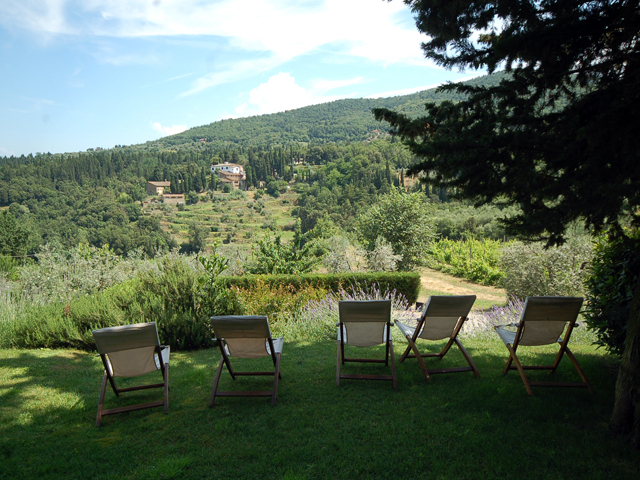 Built into the steep seaside slope, it offers amazing views. It is most definitely more vibrant and fun in the peak summer season…with the many shops full of merchandise, the cafes and restaurants full of contented clients, and the primarily pedestrian streets bustling with tanned sandal-footed tourists. Amalfi – Amalfi was a very powerful town and the first Sea Republic in Italy, later joined by Pisa, Venice and Genova. Amalfi is now a peaceful resort town with great views whose main historical sight is the Duomo (Cattedrale di Sant’Andrea) which has an interesting mix of Moorish and early Gothic influences. Ravello – Perched on a ridge high above Amalfi (40 km from Sorrento) is enchanting with stupendous views, quiet lanes, and two important Romanesque churches. Ravello hosts one of Italy’s most famous music festivals. Praiano – An ancient fishing village turned into a prestigious seaside resort; where have we heard that before? More “spread out” than the other villages, see the church dedicated to St. Luke, the Chiesa di San Luca Evangelista, containing relics of the saint. Train travel in Italy is cheap compared to surrounding countries. But there’s a catch: major rail lines in Italy tend to have a vast ridership and seats during “rush hours” can be difficult to find on Italian trains. Below are some basics. I strongly recommend making your reservations in advance (often can be done within 60 days of travel) in either first or second class. (My agency is a train broker for Europe…so we can make and ticket train reservations). There can be many advantages to doing your travel by train…that is assuming that your intended destinations have rail access. But a key to a successful rail journeys is that you travel light and can handle your luggage with ease. So where can you go on the Italian train? Check this Italy Rail Map on Europe Travel. The list below is prioritized by cost and speed, expensive and fast trains first. Italy’s premier train, not to be confused with the Eurostar that plies the English channel (the Italian Eurostar was first to claim the name). Seat reservations on Eurostar Italia are manditory. Eurostar travels swiftly between major Italian cities. Relatively fast trains that run the length of Italy, stopping at the large cities. First and second class service is available. First class coaches offer slightly better seats and are generally less populated. Seat reservations are compulsory on the Intercity Plus trains, and the fee is included in the ticket price. Seat reservations can be made for some Intercity trains, too. These are the local trains, often running around work and school schedules. They are cheap and usually reliable–but seats can be hard to find on major routes. Many regional trains have only second class seats, but if available, consider first class, asking for Prima Classe, per favore, it’s less likely to be full especially during commute times.